If you are looking for a unique apartment with a specific layout, you’ll likely find it at The Legacy at Arlington Center! We offer more than 40 different floor plans, ranging from garden apartments to townhomes with one- and two-bedroom layouts. Our spacious apartments provide generous closet space, well-appointed kitchens, and select townhomes have private patios. 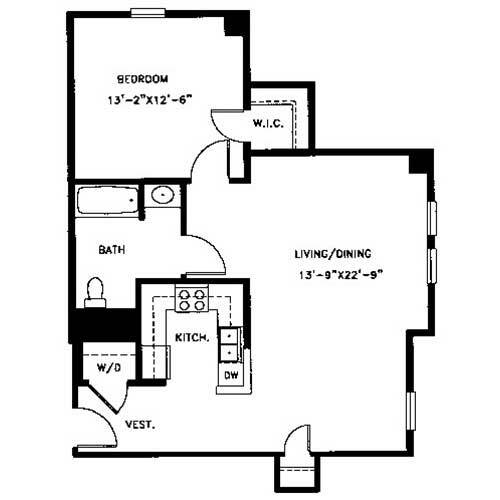 This is a two-bedroom, two-bath apartment with 1,067 square feet of living space. The foyer features a coat closet and leads past the U-shaped kitchen. There’s an open living and dining room, a utility closet with washer/dryer, and a guest bedroom and bath. The master bedroom features two closets, and an en suite bath with dual sink and a linen closet. 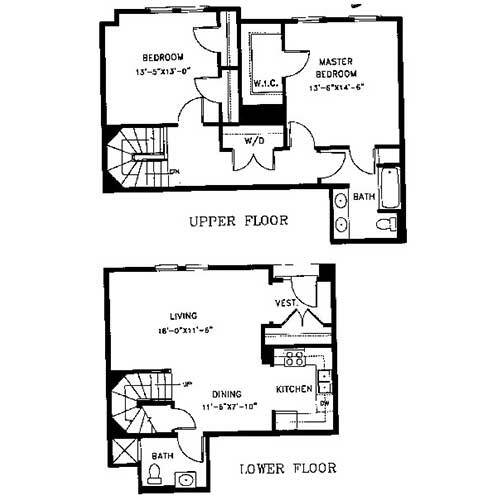 This floor plan is a two-bedroom, two-bath flat with 1,225 square feet of living space. This plan features a U-shaped kitchen, separate dining room, and large living room. A coat closet is located in the vestibule, and the utility closet with washer/dryer is located in the hall across from the guest bedroom. The master suite features a skylight, a sitting area, two closets, and a private bathroom. 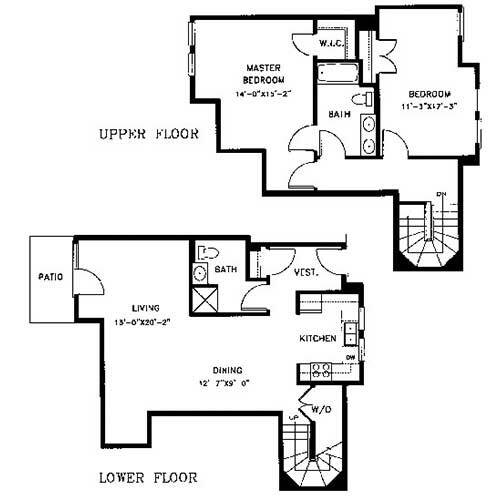 This two-bedroom, two-bath townhome has 1,543 square feet of living space. Step into the vestibule from the front porch and you’re facing the staircase. On one side, there’s the living room with access to the private patio. The opposite side contains a full bathroom, the U-shaped kitchen, and the dining room. The lower level also contains a coat closet and a linen closet. The upper level contains the utility room with washer/dryer, the master suite with private access to the Jack-and-Jill style bathroom, and the second bedroom. 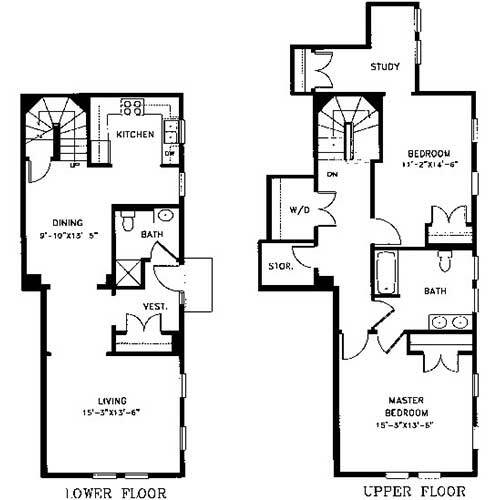 The B-2 floor plan is a two-bedroom, two-bath townhome with 1,450 square feet of living space. The main floor contains the U-shaped kitchen, the living and dining area, a large patio, a utility closet with washer/dryer, and a bathroom. The lower level contains the master suite with huge walk-in closet, a large bathroom with dual sinks and a linen closet, and a second bedroom with two closets. 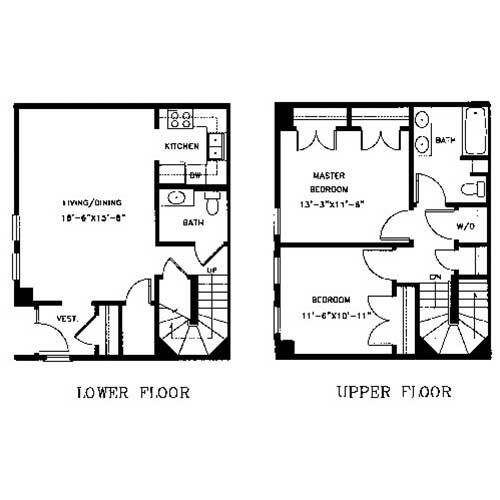 This two-bedroom, two-bath townhome has 1,407 square feet of living space. The lower level features a vestibule with huge coat closet, an open living and dining area, a U-shaped kitchen, and a bathroom. The upper level has a master bedroom with walk-in closet, the utility room with washer/dryer, a second bedroom with two closets, and a Jack-and-Jill style bathroom with dual sinks. This 1,571-square-foot townhome has two bedrooms and two bathrooms. The lower level contains a central vestibule with coat closet. On one side of the entryway is the dining room and U-shaped kitchen with breakfast bar. On the other side is the guest bathroom and the living room. The upper floor contains the master suite, a Jack-and-Jill style bathroom with dual sinks, the utility closet with washer/dryer, and the guest bedroom. 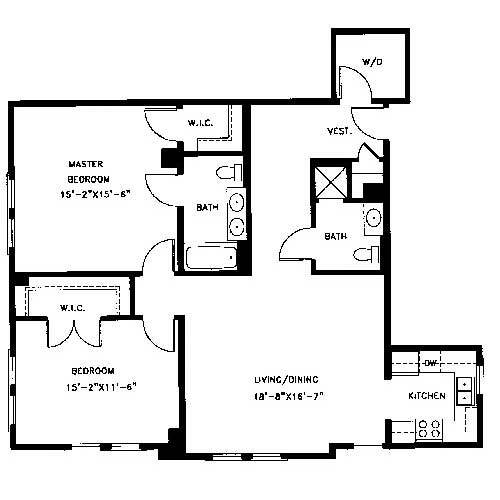 The B-5 is a two-bedroom, two bath townhome with 1,385 square feet of living space. The lower level contains the great room, a storage closet, a guest bathroom, and the U-shaped kitchen with breakfast bar. The upper level features a master bedroom with walk-in closet, a guest bedroom, the washer and dryer, a linen closet, and the Jack-and-Jill style bathroom with dual vanity. The B-6 is a two-bedroom, two-bath townhome with 1,555 square feet of living space. The main level contains the great room with storage closet, a bathroom, and the large kitchen with breakfast bar. 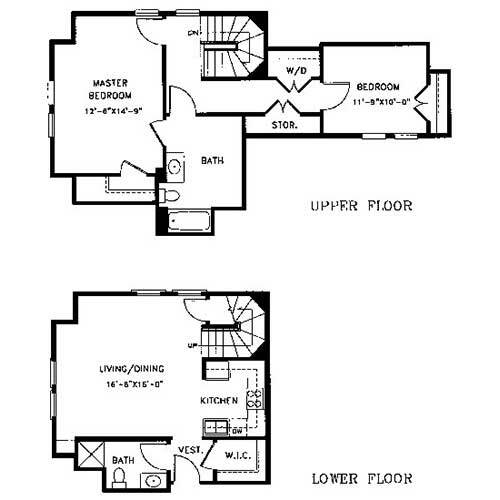 The upper level contains the master bedroom with walk-in closet and private bath access, the utility closet with washer/dryer, a linen closet, and the second bedroom. 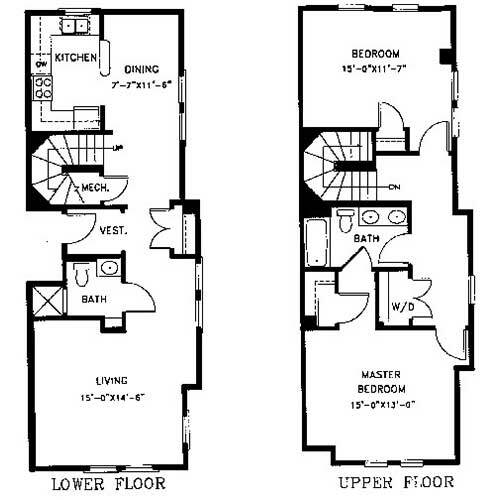 This two-bedroom, two-bath apartment has 1,115 square feet of living space. It is a split floor plan with the master bedroom and en suite bathroom on one end of the apartment, and the second bedroom and guest bathroom with walk-in closet on the opposite end. This apartment has a large great room, a U-shaped kitchen, a coat closet, and a utility room with washer/dryer. 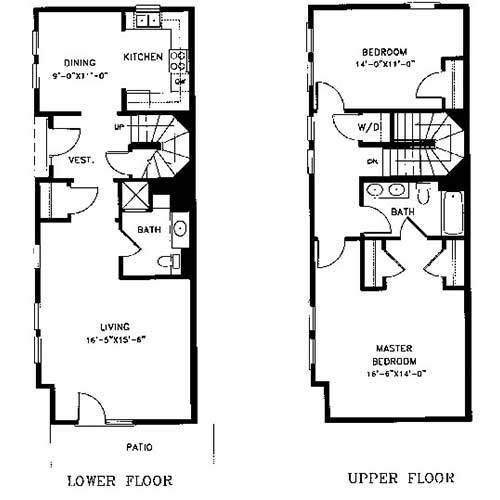 The C-1 floor plan is a two-bedroom, two-bath apartment with 1,450 square feet of living space. The lower level has a private foyer with coat closet, a spacious living and dining room, a bathroom, and an open kitchen. The upper level contains the master bedroom with walk-in closet, the guest bedroom with two closets, and the Jack-and-Jill style bathroom. 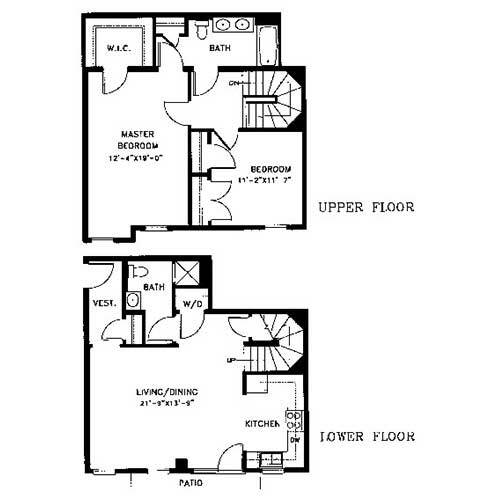 This two-bedroom, two-bath townhome has 1,407 square feet of living space. The lower level features a large vestibule with coat closet, an open living and dining area, a U-shaped kitchen, and a bathroom. The upper level contains the master bedroom with walk-in closet, the second bedroom with dual closets, the utility room with washer/dryer, and the Jack-and-Jill style bathroom with dual vanity. 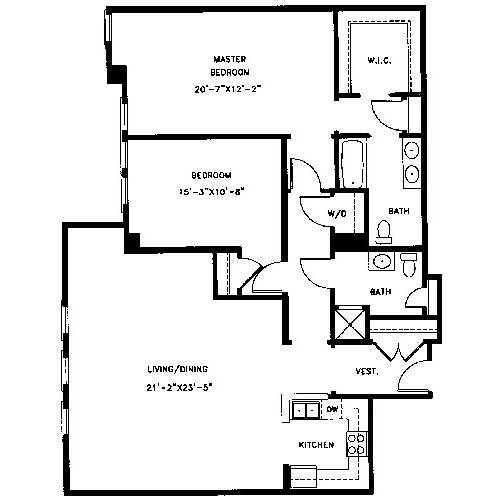 The C-3 is a two-bedroom, two-bath floor plan with 1,598 square feet of living space. The lower level features a spacious vestibule with coat closet, a separate dining room and U-shaped kitchen, an open living room, a guest bathroom, and a patio. 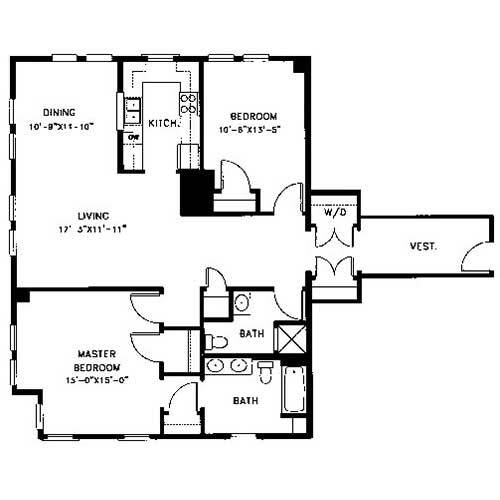 The upper level contains the master suite with dual closets and private bath access, and the guest bedroom. This townhome has two bedrooms, two bathrooms, and 1,405 square feet of living space. The lower level contains the open great room, a guest bathroom, and a large kitchen with breakfast bar. The upper level contains a master bedroom with walk-in closet, a second bedroom with dual closets, the utility closet with washer/dryer, a linen closet, and the Jack-and-Jill style bathroom with dual vanity. This 1,525-square-foot townhome contains two bedrooms and two bathrooms. The lower level contains a large living and dining area, a kitchen with breakfast bar, a spacious storage closet, and the guest bathroom. The upper level contains the master bedroom with walk-in closet, the second bedroom, a full bathroom with dual vanity, and the utility room with washer/dryer. 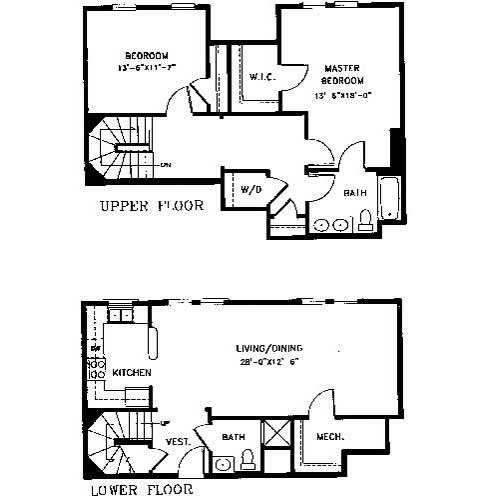 This two-bedroom, two-bath townhome has 1,544 square feet of living space. The main floor has the open living room, a guest bathroom, a coat closet off the entryway, and the spacious kitchen and dining area. The upper level has a master suite with two closets, a second bedroom, the utility room with washer/dryer, and a full bathroom. 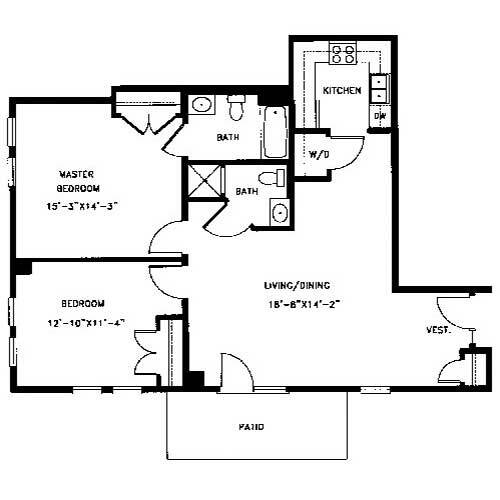 Plan D is a two-bedroom, two bath apartment with 1,386 square feet of living space. 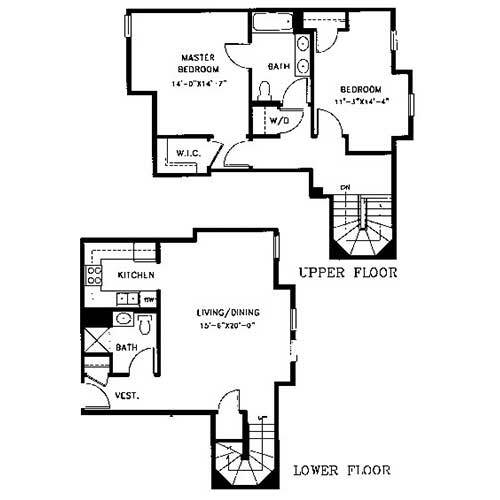 This floor plan features a large, private vestibule with coat closet and the utility closet with washer/dryer. 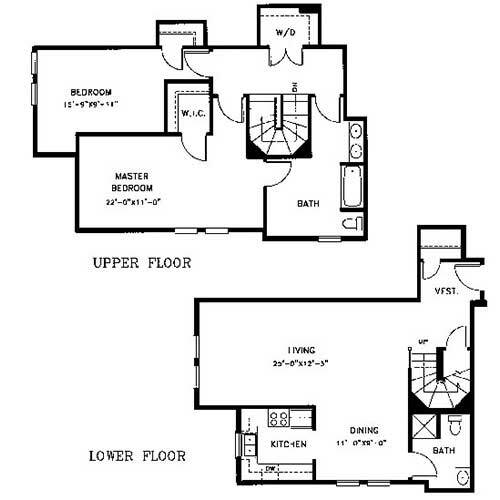 This is a split plan with the master containing two closets and an en suite bath with dual vanity. The living room, dining room, and U-shaped kitchen are in the center of the apartment, with the guest bedroom located behind the kitchen. 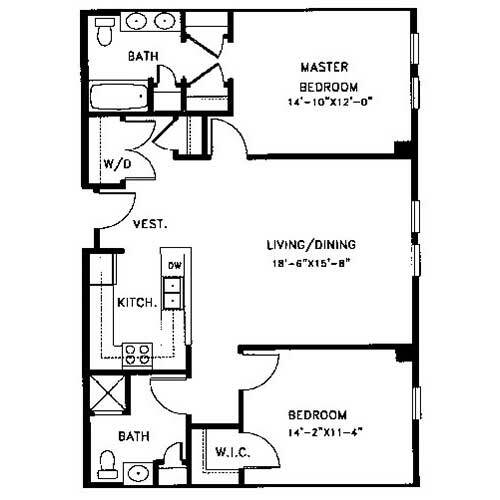 The D-1 is a two-bedroom, two-bath floor plan with 1,254 square feet of living space. The main level features a huge great room, a separate vestibule with coat closet, utility closet with washer/dryer, and a U-shaped kitchen. The upper level contains the master bedroom with en suite bath, a second bedroom, and the guest bathroom. 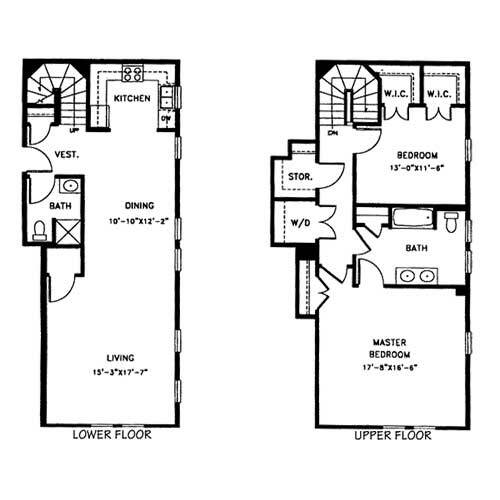 Legacy at Arlington Center’s D-2 floor plan is a spacious two-bedroom, two-bath townhome with 1,377 square feet of living space. 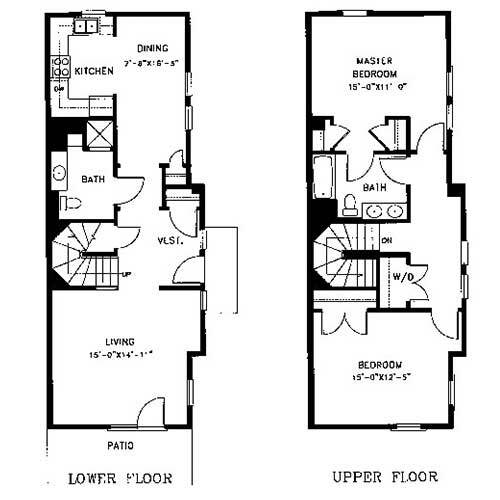 The lower level contains the great room, utility closet with washer and dryer, and the U-shaped kitchen. The upper level contains the master suite with huge private bathroom, the guest bedroom, and the guest bathroom. 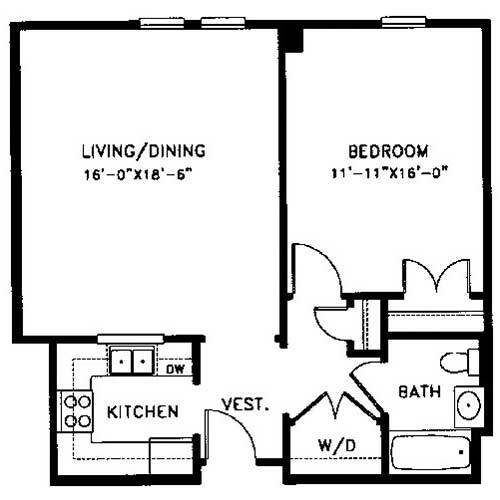 This is a one-bedroom, one-bath apartment with 795 square feet of living space. It features an open living and dining area, a U-shaped kitchen, a utility closet with washer/dryer, and a large bedroom. 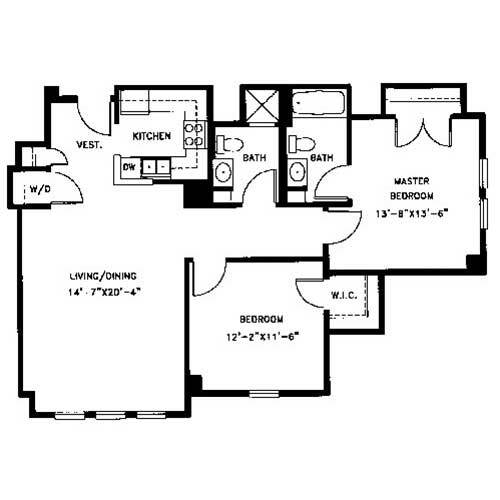 The E-1 is a two-bedroom, two-bath townhome with 1,454 square feet of living space. The lower level contains the large living area, vestibule with coat closet, dining room, U-shaped kitchen, guest bathroom, and a patio. The upper level contains the master suite with private bath and walk-in closet, the second bedroom, a utility closet with washer/dryer, and a storage closet. 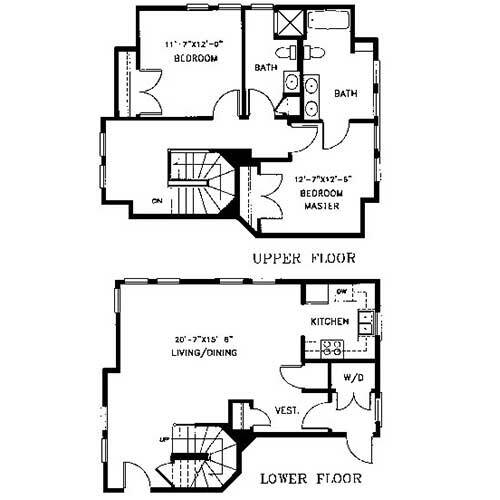 The E-2 floor plan is a two-bedroom, two-bath townhome with 1,493 square feet of living space. The first floor contains the large living and dining room, a patio, a U-shaped kitchen, and the guest bathroom. The upper level contains an oversized master suite with walk-in closet, second closet, and en suite bath with linen closet. The second level also contains the utility room with washer/dryer and a large guest room. 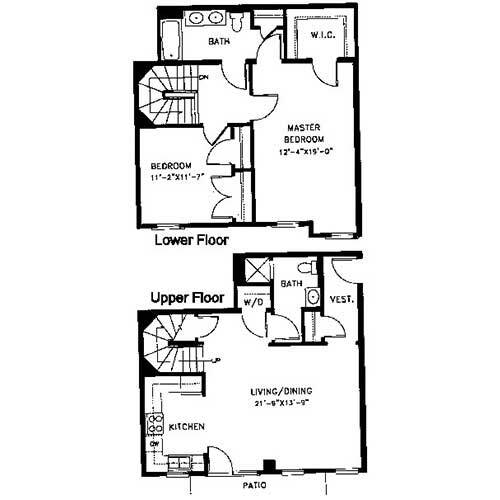 The E-3 is a two-bedroom, two-bath townhome with 1,544 square feet of living space. The lower level contains a huge living room, a vestibule with coat closet and guest bathroom, a U-shaped kitchen, and the separate dining room. The upper level contains the master bedroom with en suite bath, a storage closet, a utility room with washer/dryer, and a second bedroom with bonus study. This 1,233-square-foot townhome has two bedrooms and two bathrooms. The lower level contains a huge great room, open L-shaped kitchen, a patio, and the guest bathroom. The upper level contains the master bedroom with walk-in closet and bathroom, the utility closet with washer/dryer, and the second bedroom. 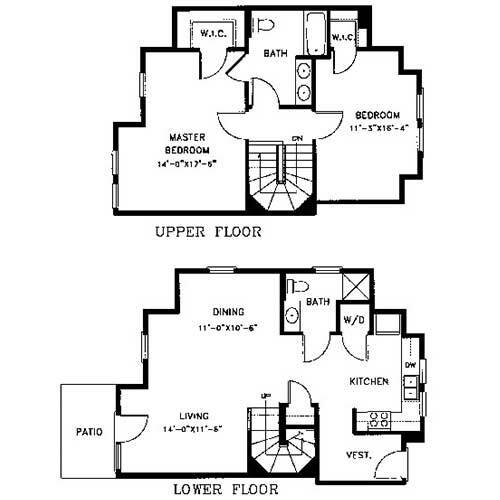 This two-bedroom, two-bath floor plan has 1,393 square feet of living space. The lower level contains the living room, dining room, patio, guest bathroom, utility closet with washer/dryer, L-shaped kitchen, and a large vestibule. The upper level contains a large master bedroom with walk-in closet, a second bedroom with walk-in closet, and a Jack-and-Jill style bathroom. On the main floor of this two-bedroom, two-bath townhome, you’ll find a large kitchen and dining area, a separate living room with access to the patio, a vestibule, and a guest bathroom. The upper level of the 1,419-square-foot floor plan contains the master suite with walk-in closet, the guest bedroom, and a Jack-and-Jill style bathroom. 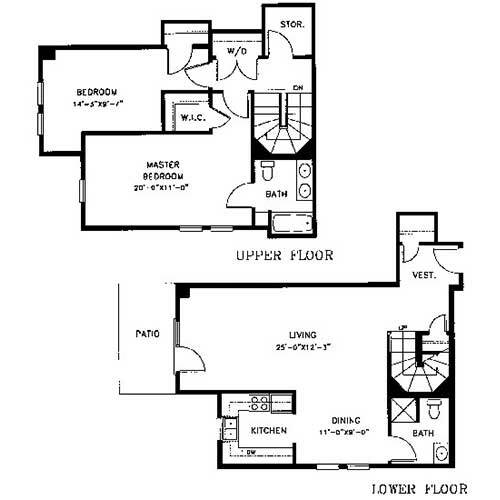 The E-7 is a two-bedroom, two-bath townhome with 1,588 square feet of living space. The first level has a vestibule with coat closet that leads into the large living room. The U-shaped kitchen is open to the dining room. A guest bathroom and storage closet is also located on the main floor. The upper level contains a master suite with walk-in closet, a guest bedroom with walk-in closet, a utility room with washer/dryer and shelving, and a huge Jack-and-Jill style bathroom with dual vanity. The lower level of this two-bedroom, two-bath townhome contains an open living and dining area, a storage closet, a U-shaped kitchen, a vestibule with coat closet, and a guest bathroom. The upper level features the oversized master with walk-in closet and en suite bath, the second bedroom with walk-in closet, and the utility room with washer/dryer. 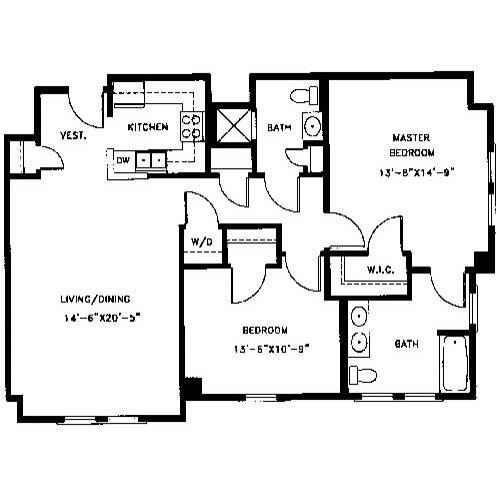 This floor plan has 1,563 square feet of living space. 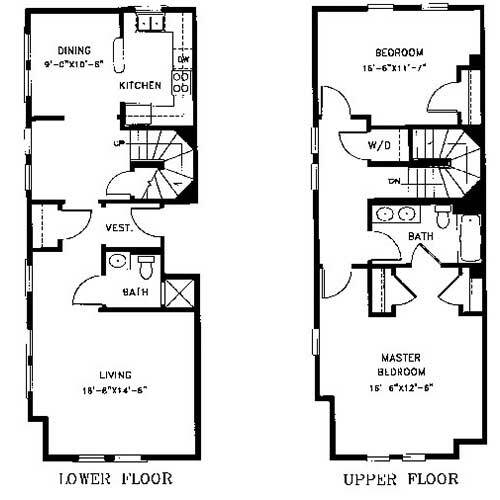 The E-9 floor plan is a two-bedroom, two-bath townhome with 1,744 square feet of living space. The main floor contains the open living and dining room, the U-shaped kitchen, and a guest bathroom. The upper level contains the master bedroom, the second bedroom with two walk-in closets, a storage closet, the utility closet with washer/dryer, and a Jack-and-Jill style bathroom. 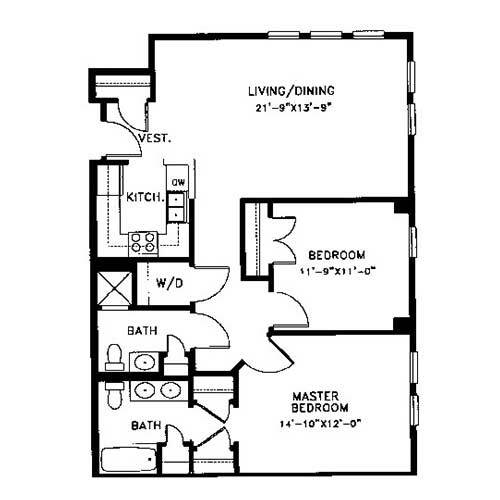 Legacy at Arlington Center’s E-10 floor plan is a two-bedroom, two-bath townhome with 1,184 square feet of living space. The main level contains the great room, U-shaped kitchen, guest bathroom, and a vestibule with walk-in closet. The upper level contains the master and guest bedrooms, the second bathroom, a storage closet, and the utility closet with washer/dryer. 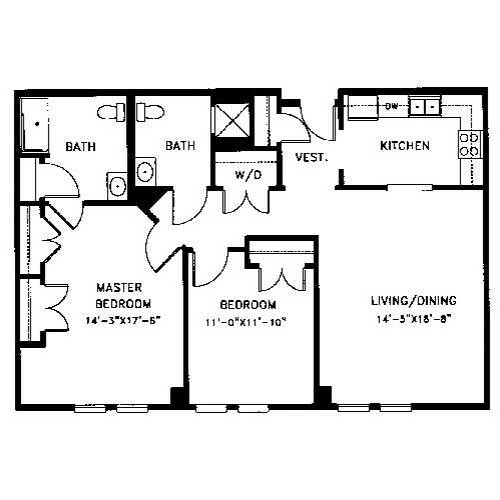 The E-12 is a two-bedroom, two-bath floor plan with 1,407 square feet of living space. The lower level of this townhome contains the living and dining area, the guest bath, and the U-shaped kitchen. The upper level contains the master bedroom with walk-in closet, the second bedroom, the utility closet with washer/dryer, and a Jack-and-Jill style bathroom. 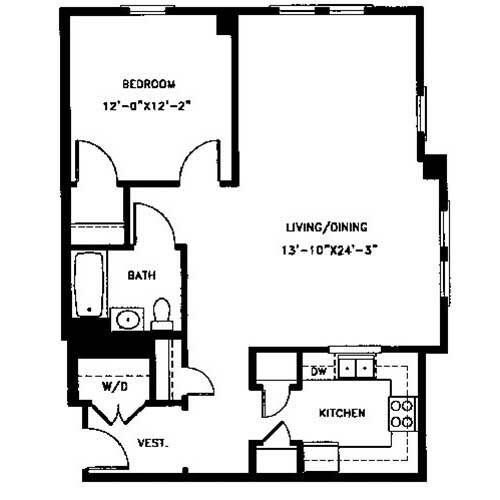 This is a two-bedroom, two-bath apartment with 1,149 square feet of living space. It has a large great room, an L-shaped kitchen, a master bedroom with two closets and an en suite bath, a second bedroom and bath, and a utility room with washer/dryer. 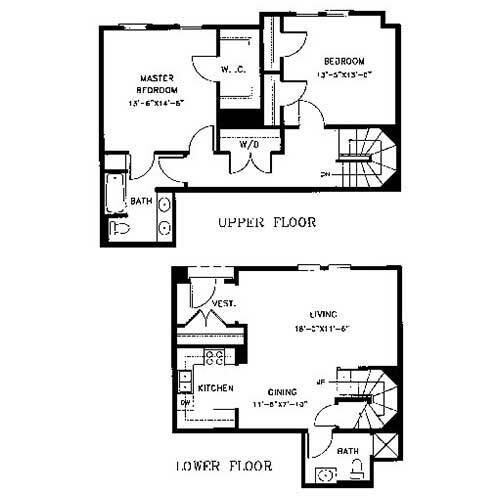 This is a unique split floor plan with two bedrooms, two bathrooms, and 1,077 square feet of living space. The middle of the apartment contains the great room and U-shaped kitchen. The guest bedroom and guest bath are on one side of the common area, while the master suite is on the other side and includes a private bathroom. There’s also a utility closet with washer/dryer and a vestibule with coat closet. 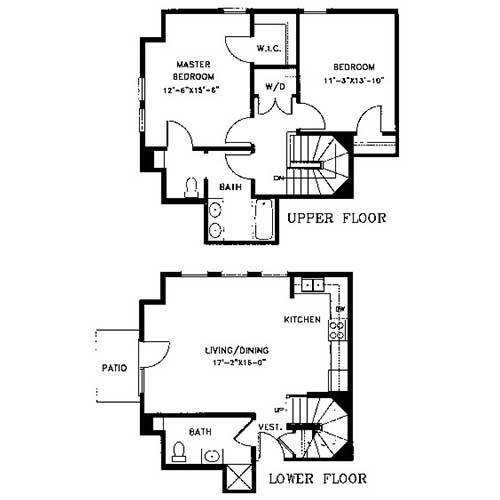 Floor plan K is a two-bedroom, two-bath floor plan with 1,256 square feet of living space. This apartment features a large master suite with private bath, a great room, a U-shaped kitchen, and a large guest bedroom with walk-in closet. The vestibule leads to the coat closet, utility closet with washer/dryer, and the second bathroom. 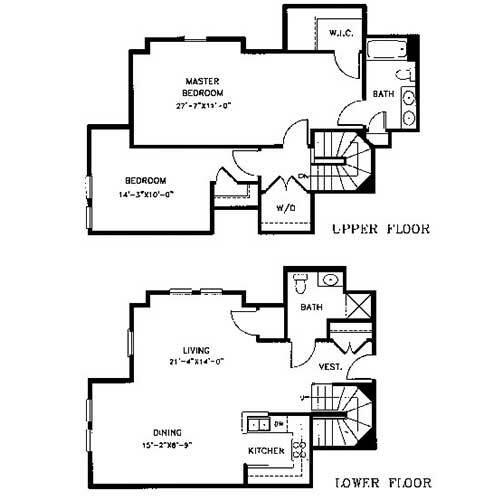 Floor plan L is a two-bedroom, two-bath townhome with 1,147 square feet of living space. 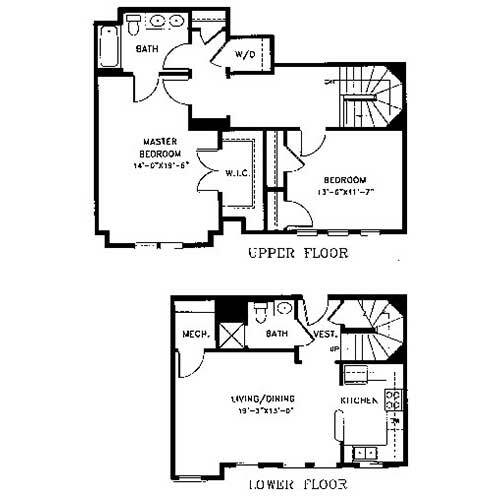 The lower level contains the vestibule with coat closet, the great room, the U-shaped kitchen, and a guest bathroom. 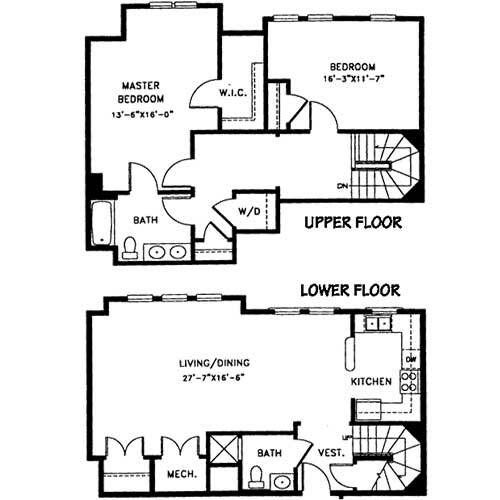 The upper level contains the master with dual closets, the second bedroom, the second bathroom, a linen closet, and the utility room with washer/dryer. 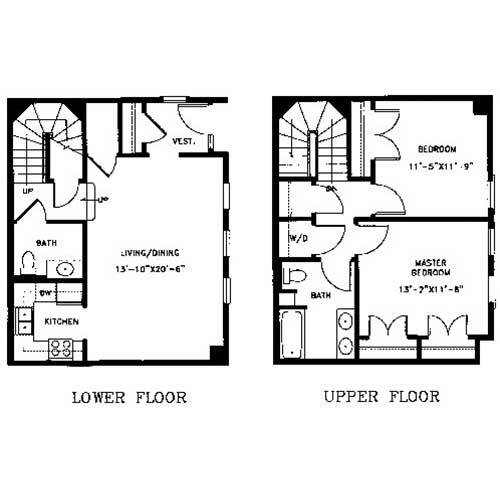 This two-bedroom, two-bath townhome has 1,171 square feet of living space. The lower level contains the great room, U-shaped kitchen, guest bathroom, storage closet, and vestibule with coat closet. The upper level contains the master bedroom with two closets, the guest room, the utility closet with washer/dryer, a storage closet, and a full bathroom. 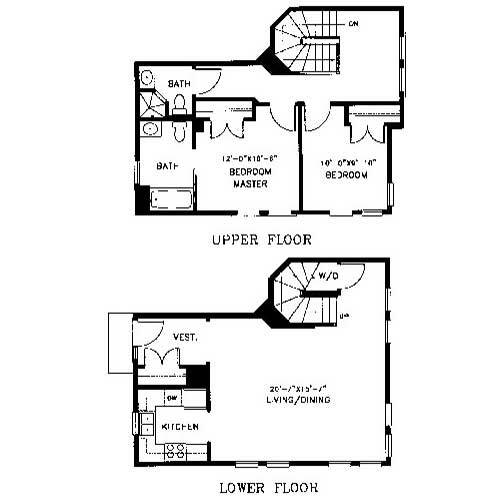 This two-bedroom, two-bath floor plan includes a patio and has 1,103 square feet of living space. The great room leads to the patio. The U-shaped kitchen and washer/dryer are located in the rear of the apartment. The master bedroom includes an en suite bathroom. 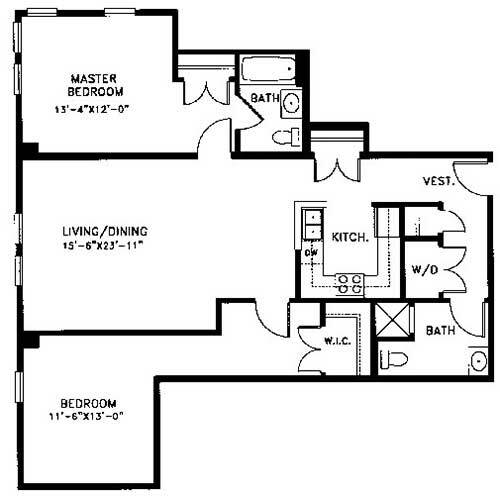 This is a one-bedroom, one-bath floor plan featuring 939 square feet of living space. The vestibule includes the utility closet with washer/dryer and a coat closet. The U-shaped kitchen has two pantry closets. 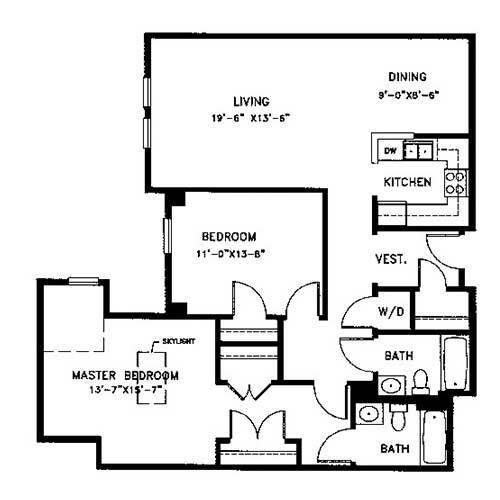 This two-bedroom, two-bath floor plan has 1,167 square feet of living space. It features a huge living and dining area, a U-shaped kitchen, a master bedroom with large en suite bathroom and walk-in closet, a gust room, guest bathroom, and a utility closet with washer/dryer. 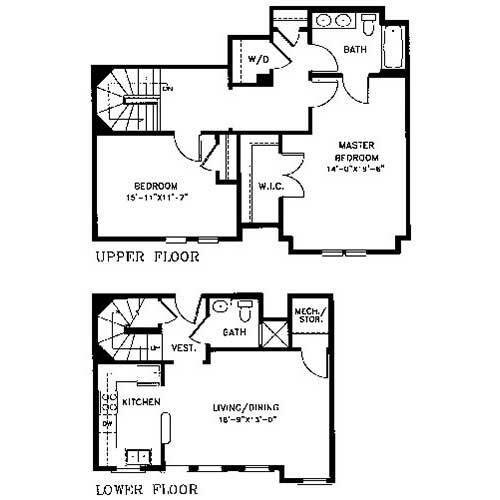 This two-bedroom, two-bath floor plan has 1,568 square feet of living space. It has a U-shaped kitchen that overlooks a large living and dining area, a large master suite with dressing area, private bathroom, and walk-in closet, a guest bedroom and bath, a utility closet with washer/dryer, and a large coat closet in the foyer. This 1,288-square-foot-apartment features two bedrooms and two bathrooms. It has a large laundry room with washer/dryer, a master bedroom with walk-in closet and en suite bath, a second bedroom with walk-in closet, and a U-shaped kitchen. 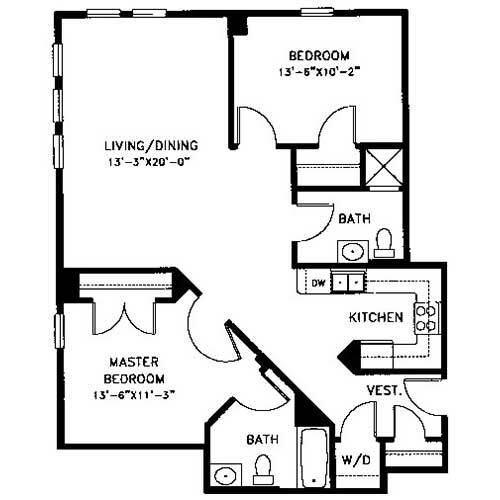 This Legacy at Arlington Center floor plan is a one-bedroom, one-bath unit with 823 square feet of living space. This apartment features a U-shaped kitchen, utility closet, open great room, coat closet, and a generous bedroom with walk-in closet. 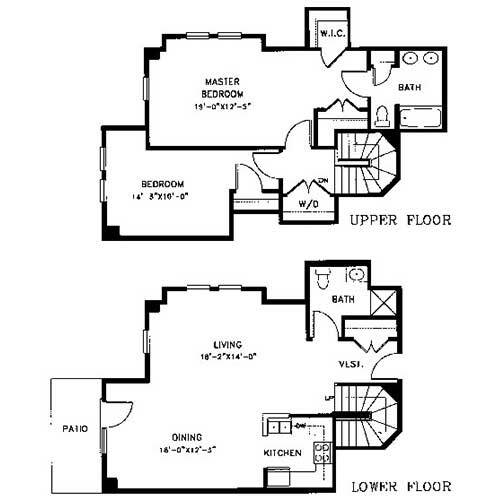 This two-bedroom, two-bath floor plan has 1,061 square feet of living space. It has an open living and dining area, utility closet with washer/dryer, and a U-shaped kitchen. The master bedroom includes an en suite bath, while the second bedroom has a spacious walk-in closet.